How to Explain the Hobby of Baseball Cards to Anyone! It's hard to imagine, because I still remember vividly as the calendar flipped from 2017 into 2018, but Thanksgiving and the Holiday Season are already upon us! What should you discuss about Baseball Cards? I figured you might ask that! I wrote the following script for you, from which you can use bits and pieces of in your conversation with Uncle Bart, Aunt Betty, Cousin Louis, your neighbor, Henry, 3rd cousin removed, Tina...you get the point! Collecting Baseball Cards help relieve stress for many people who love sports, which is why Baseball Cards have been an irreplaceable part of American culture for over a century. These cardboard treasures give collectors a chance to see the stats and pictures of their favorite players, and are fun and not limited to any age or gender of collector. Baseball Cards have come a long way in the past decade. As some collectors grew weary of the traditional card format, card companies needed to find a niche that would help boost the excitement of their product, so they pioneered numerous advancements in the trading card field. These companies, such as Topps, Bowman, Upper Deck, Panini, and Donruss, among others, have created numerous specialized and highly sought-after types of cards. 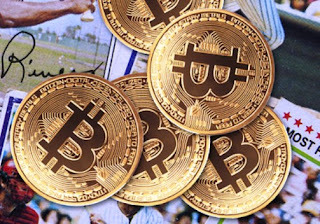 For instance, Topps, one of the industry's top companies and producers of Baseball Cards for about 70 years, has found a host of ways to keep collectors interested. In their latest set of cards, they have offered up the opportunity to get cards that are signed by the players that they represent, giving the card collectors an exciting sense of thrills every time that they open a new pack (with the possibility of getting an autographed card!). Additionally, giving collectors a sense of owning a piece of history, they have begun to place actual pieces of game memorabilia within the cards. So, basically, you may end up opening a pack and getting a piece of fabric directly from the jersey of one of your favorite players, or even a chip of their bat. These game-used memorabilia cards (referred to as "GU") don't necessarily have to come from players that played the year the cards were printed - if you get lucky, you may find yourself with a piece of a bat used by Joe DiMaggio! That can add a very interesting prospect to sports card collecting. These specialized memorabilia cards feature extremely limited print runs, allowing for a high value to be assessed for the more unique cards, and some of these more unique cards for the best players may fetch upwards of hundreds of dollars, so it's almost like buying a lottery ticket! Sure, some of the cards may cost more by-the-pack, but it is clearly worth it to have such an exciting chance to get close to your sports idols. With all of these opportunities for hungry collectors, Baseball Cards are in more demand than ever before. Aside from the potential for huge profits from collecting Baseball Cards, collecting Baseball Cards and focusing on them in making sets or sub-sets can help relieve stress & anxiety by acting as a pleasant distraction to everyday stress. This calming effect helps fight everyday tensions, especially during the holiday season! Did You De-Stress Your Thanksgiving Dinner? 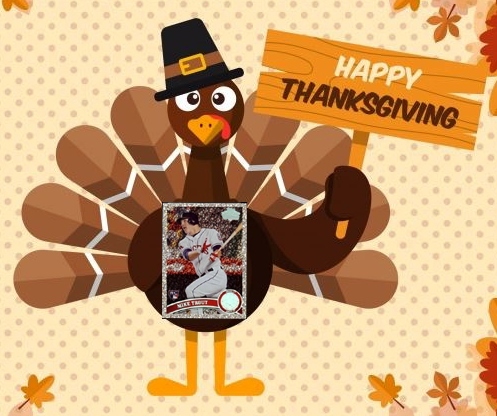 My sincere hope is that you were able to steer the conversation of your Turkey-Time dinner to a more pleasant and enjoyable topic, Baseball Cards, in which everyone can participate in and enjoy. For being a Thanksgiving Dinner/Turkey-Time Hero, it's your time to have some fun! In honor of "Cyber-Cember" (Cyber December), this offer extends throughout the month of December...all the way until the last day of the year !! Have a very Happy Thanksgiving, enjoy, and be safe! !